Lenovo on Tuesday introduced ThinkPad ultraportable laptops, including a tablet, which the company said enterprises prefer over the new breed of keyboardless tablets, which are also called slates. The ThinkPad X201 Tablet has a 12.1-inch screen and runs on Intel Core i7 processors, the company said. The laptop has a traditional convertible tablet design, with a keyboard, and a touch screen that can be rotated and placed on top of the keyboard to record data. There is growing momentum behind a new generation of tablets, also called slates by PC makers, which are handheld devices on which users can browse the Internet, play games, read e-books and view video content. Slates usually have software-based on-screen keyboards. Slates have promise in the consumer segment, but have limited functionality that could restrict their use in enterprises, said Mika Majapuro, senior product marketing manager at Lenovo. While the convertible-tablet market is small, enterprise users need laptops for more than viewing content. "There are not many customers who are willing to give up their keyboards," Majapuro said. Convertible designs also have larger screens and offer the flexibility for enterprises to run more software, Majapuro said. Lenovo has, however, moved ahead with a slate product in the consumer space. 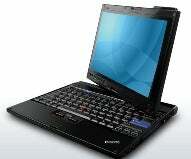 Lenovo earlier this year launched the IdeaPad U1 Hybrid, a laptop that includes a detachable touch screen. The screen turns into a tablet on which users can surf the Web, play games or read e-books. The U1 Hybrid will cost about US$1,000. IBM came out with the first tablet in a slate form in the early 1990s, said David Hill, vice president of brand management and design at Lenovo. That slate was developed for insurance companies to carry out certain tasks, but the design was ultimately carried over to the new ThinkPad clamshell laptops, Hill said. "We've learned in a business situation -- there's a large desire to marry tablet function with rich content creation," Hill said. The tablet balances the slate functionality of viewing rich content, while providing a keyboard to create documents. If the U1 Hybrid takes off with consumers, similar designs for tablet PCs with detachable screens could make their way into the enterprise, Hill said. But advances need to be made in developing strong on-screen keyboards. Corporate buyers were initially skeptical about technologies like CD drives in laptops when they first came out, but these became popular after the technology took off in the consumer space, Hill said. The X201 Tablet will come with the Windows 7 or Windows XP operating system. It will include hard drive storage of up to 500GB or SSD storage of up to 128GB. Integrated wireless connectivity options include Wi-Fi, WiMax and Bluetooth. It will weigh 3.57 pounds (1.62 kilograms) with a 4-cell battery and 3.95 pounds with an 8-cell battery. Pricing for the laptop starts at $1,549. The company didn't comment on worldwide availability. The company also announced the new ThinkPad X201 and X201S laptops, which are priced starting at $1,199 and $1,599, respectively, company officials said. Based on Intel's Core i5 and Core i7 processors, the laptops include 12.1-inch screens and a runtime of up to 12.2 hours on 9-cell batteries.